How can I find out my Keezel's IP address? For Keezel to Keezel, you will need 2 Keezels. You can leave one Keezel at home and take another Keezel with you whenever you're on the road so you can pair them up and build your very own secured tunnel in no time. - maybe you're on vacation and you want to access websites and services that are only available in your country, or perhaps even only with your home IP. - or your cable provider allows you to watch sports games, but only from your home WiFi. With Keezel to Keezel you can access your home WiFi from anywhere, thus watch sports games or TV-shows as if you were at home. - perhaps your kids want to watch their favourite TV-shows on vacation, but when you are abroad your online video on demand service may not have these in their own language. But if you use Keezel to Keezel, it will. - maybe you want to keep one Keezel at a friend's place and use your home one to connect to that so you can access websites that are geo-blocked to his country. - maybe you're travelling to a country where most of the internet is restricted and impossible to access with a local IP address. Copy-paste and save the code generated when you push the Set this Keezel button, as you will need it when connecting to your home Keezel with the travelling one. Also, make sure to copy-paste and save the Port, Protocol and IP address displayed, as you will need this info for the next step, which requires you to make some changes to your home router, otherwise Keezel to Keezel might not work. Your Keezel at home can only be reached if you have port forwarding setup on your home router (the device you got from your internet provider). Alternatively, you can use UPnP, which is not recommended because of the related security risks. Each router has a different way to setup port forwarding. Connect your laptop to your home router directly and then connect to your home router (often this requires you to type in 192.168.1.1 in your browser, check your home router for this information). When you are connected and have the router menu in front of you, you will have to find a section on port forwarding. You will need 3 pieces of information for port forwarding. Please note that while the home keezel is in keezel to keezel mode, it cannot also be used as a standalone keezel (meaning that if you connect a device to the home keezel wifi, that device will not have access to the internet). If you want to use a keezel that's been set up in keezel to keezel mode as a standalone keezel, you must first cancel keezel to keezel: connect to the keezel, go to keezel/ (or 192.168.11.1) in your browser, click on the hamburger menu (the 3 horizontal lines in the top-right corner of the screen, next to the Keezel’s battery indicator), go to advanced settings and then click on Keezel to Keezel (beta) and then on Cancel keezel to keezel. 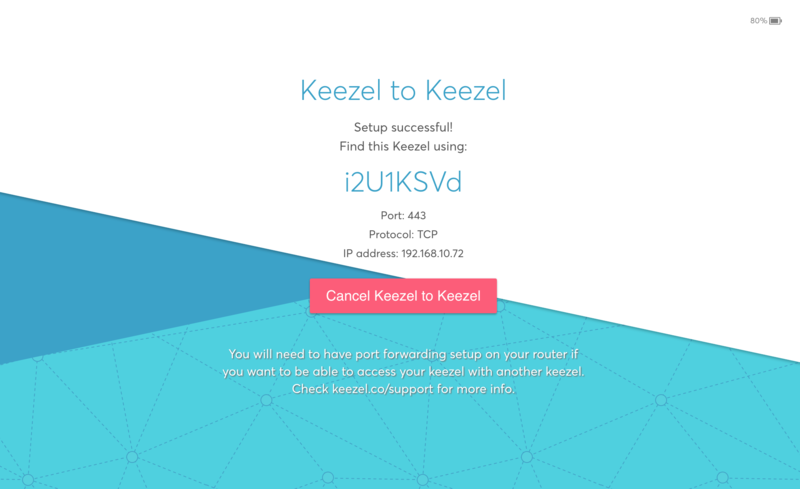 If your home Keezel is setup correctly and you have applied the port forwarding settings to your regular home router, you will be able to connect to your home Keezel when it is in Keezel to Keezel mode. Click on Connect to another Keezel. Paste or type in the code that was generated when you set up your home Keezel. Click the "Connect to this Keezel" button. Your Keezel will now connect to your home Keezel and after about 30 seconds you should see the main screen, with your home Keezel selected as the VPN location.